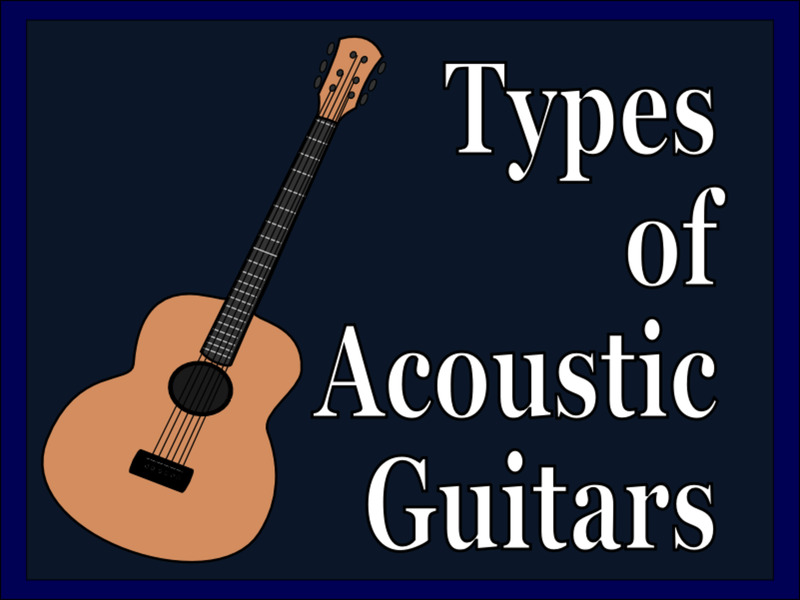 There are many sizes of acoustic guitars for many types of players. If you’ve been checking out acoustic guitars you know they all aren’t created equal. There are many different types on the market, each with its own purpose. You might think acoustics are simpler than electrics, but that’s not necessarily so. Not only are there more varieties out there to choose from, but the build techniques compare to if not surpass those of electric guitars when it comes to complexity. To compound matters, each builder sets their own definitions for body sizes. Two guitars may appear similar, but checking the specs may reveal a significant difference in body depth, waist or shoulder width, scale length or other measurements. These difference are even more problematic for beginners, who likely have no idea what any of that means just yet. If you intend to play predominantly acoustic guitar you may eventually wish to own several different kinds, each for a different playing situation. Or, if you want to focus on one guitar for your collection, you’ll want to figure out which style best matches your goals. For now, you just need to figure out where to start. There is no substitute for jumping in and doing your own research, so you can better understand what each builder brings to the table.This article is intended to help beginners understand the basics of the different guitars they have to choose from. 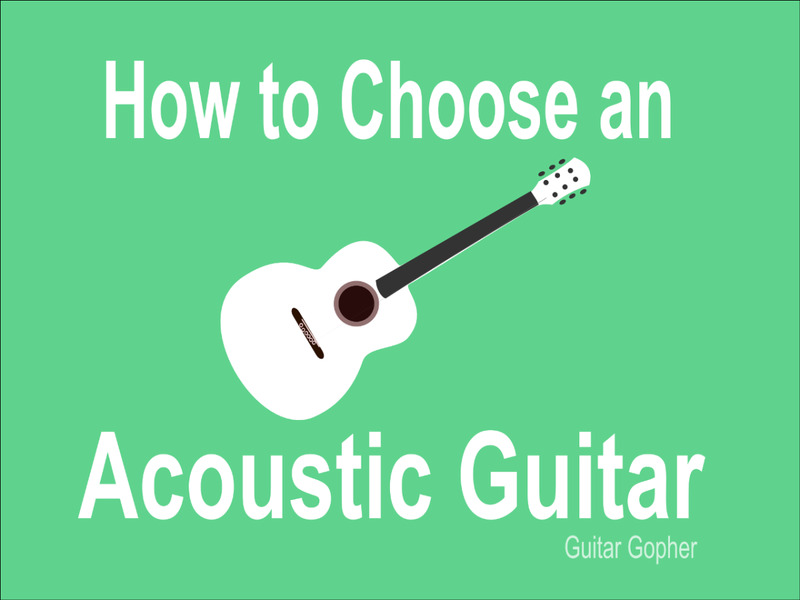 I'll explain about the different styles of acoustic guitar, and make a few recommendations for newbies. After you read this, get out there are do your own research. There is an instrument somewhere that perfectly matches your needs! Classical instruments are predominantly used for (you guessed it) classical music, but they are employed in other forms of music as well. I mention this style first because it is distinctly different from the other acoustic guitars listed below, and the point from which everything else flows. Slotted headstocks that incorporate the tuning pegs, rather than solid headstocks with the peg punched through. Classical guitars have a fantastic warm, mellow sound, and are made for playing finger-style. If you intend to study classical music this is the type you need. However, folk guitarists who appreciate the classical sound and enjoy a comfortable instrument may wish to have one in their collection as well. You also find some hybrid-type guitars on the market that incorporate acoustic steel-string designs with nylon strings. These are not traditional classical instruments, but many do sound and play wonderfully. Many beginners would do well to start with a classical instrument, particularly kids or people with sensitive fingers. The nylon strings make notes and chords easy to fret, and that makes the learning process a little smoother. 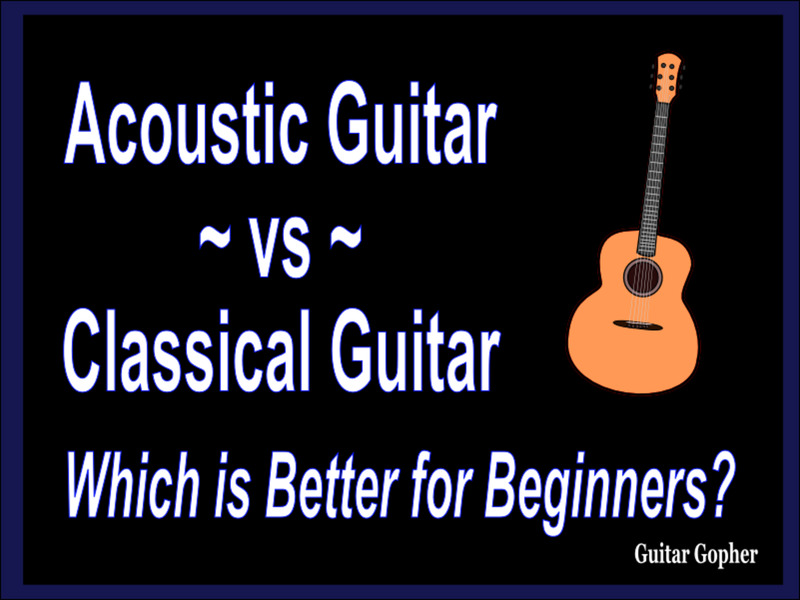 However, before you take the plunge you should do a little more research on the key differences between classical and acoustic guitars. 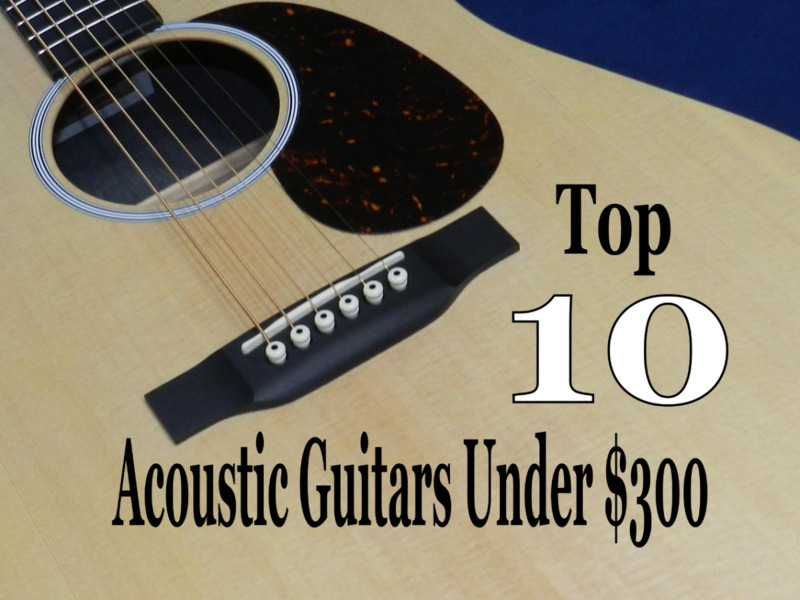 When it comes to steel-string acoustic guitars the dreadnought style is probably the most popular. The larger size and stronger construction of the body offers tremendous projection whether flat-picking or playing finger-style. At the time of the dreadnought’s introduction this was a pretty innovative leap for guitarists, who were typically playing much smaller guitars and struggled to be heard. We can thank the C.F. Martin Company for the invention of the dreadnought body style. Today, almost a hundred years later, Martin is still one of the finest acoustic guitar builders in the world. Their D-Series instruments such as the D-28 and D-18 continue to stand as icons of fine craftsmanship and sound. Of course other builders have jumped onto the dreadnought bandwagon as well, and sometimes add their own slight alterations. You’ll see slightly-narrowed shoulders, thinner or thicker bodies, wider or narrower string spacing and a wide variety of tonewoods. The dreadnought design is a great all-around instrument, and a good choice for beginners. If you are looking for a general-purpose instrument that will handle most forms of music this is the way to go, in my opinion anyway. For newbies, starting with a dreadnought-type guitar means a chance to learn the ropes before committing to any one particular style of music. I always recommend Yamaha acoustic guitars for beginners, specifically their FG800. This is a dreadnought design that sounds great, and Yamaha guitars are know for being easy to play. This is important, because struggling to fret notes and chords is hard enough when you are just starting out. You need an instrument that cooperates! Yamaha also makes quality instruments at very good price points: another bonus. If you want to take a little bit of a shortcut you can go with the Gigmaker Deluxe starter pack. 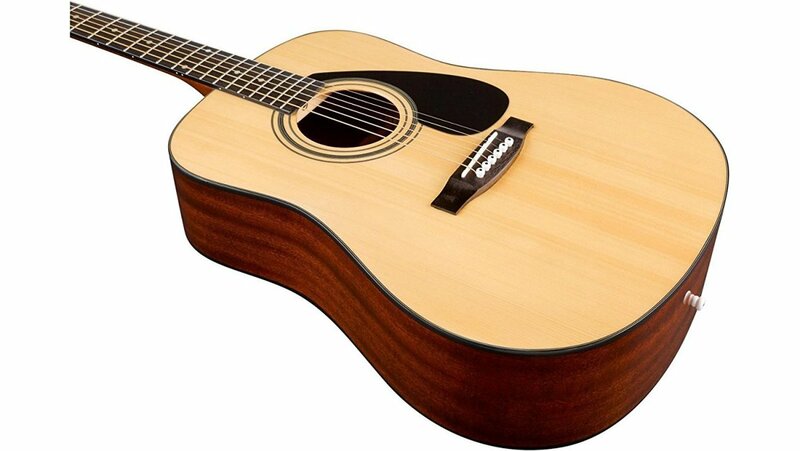 This includes the FD01S acoustic guitar, a dreadnought design similar to the FG. A starter pack will give you not only a quality Yamaha acoustic guitar, but also all the accessories you need to start playing. It's a smart and affordable way for a newbie to begin their guitar-playing career. Jumbo acoustics are built to strum. These are large-bodied guitars, and they take the boom and projection found in the dreadnought to another level. 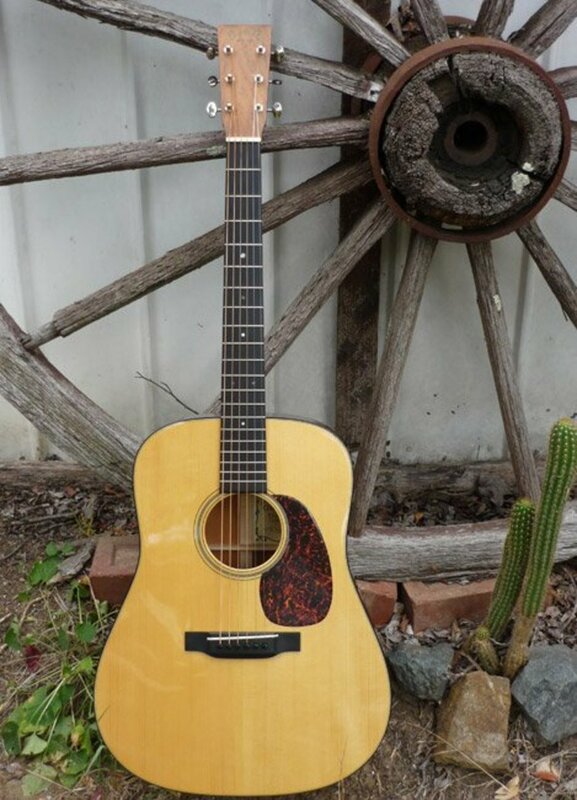 Jumbo acoustic are a favorite of country players for this very reason, particularly classic-style country. 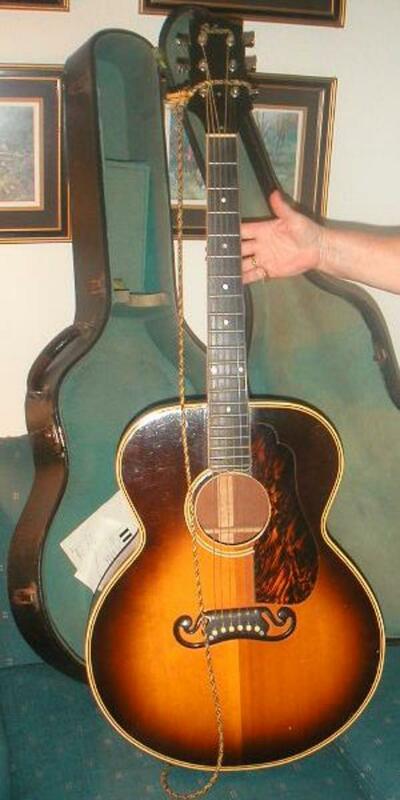 Some great examples of the jumbo design include the Gibson J-200 and the Guild F-50. These are somewhat expensive instruments, but both brands have affordable versions on the market as well. 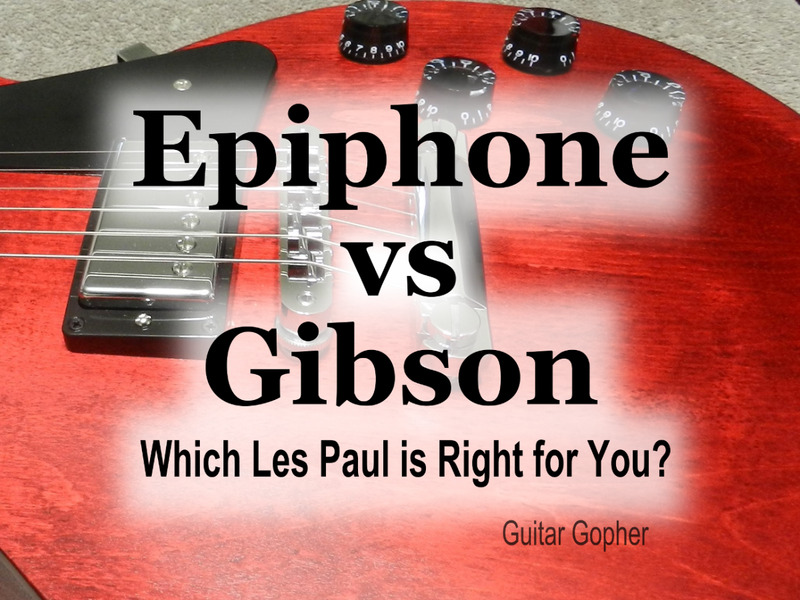 For example, Epiphone offers the EJ-200 an affordable guitar designed after the Gibson classic. If you need a guitar with great projection and bass response this may be the one for you. However, while they typically have traditional or slightly narrower string spacing, jumbos are relatively large instruments. Smaller people may find them unwieldy, at least initially, but if you really love the sound don’t let it deter you. Parlor guitars are at the opposite end of the spectrum from jumbo acoustics. These are small-body instruments, typically described as size 0 or smaller, depending on the manufacturer. Like classical guitars, they are made to be played finger-style, though of course many musicians strum to their heart’s content. They even share a few other characteristics with classical guitars. While there are many variations out there today, the traditional parlor-style guitar features a 12th fret neck-body joint and a slotted headstock like a classical instrument. When I think of parlor guitars I imagine the olden days of strumming cowboys and folk musicians. That’s not far off, because this type of acoustic is much older than most of the others in this article in terms of instrument evolution. Today, it’s a great choice for musicians looking for a handy instrument for playing around campfires or when getting together with friends. If you decide this type of guitar is right for you, these days you have a few options. You can look for a more traditional parlor guitar, as described above. Or, you can find some great small-bodied options with more modern appointments, such as standard tuners and a 14-fret neck joint. I’ve grouped a bunch of acoustic guitar styles together here, hopefully for the sake of clarity. Concert, Auditorium, Orchestra, 0, 00, 000— these are all terms that apply to instruments with a narrowed waist compared to a dreadnought design. By "waist" I mean the middle of the guitar, where the sides curve inward. Overall body size varies, depending on the manufacturer and how they define their body types. Typically, these are somewhere between a dreadnought and the smaller parlor guitars discussed above. Two of the most influential American guitar builders have played a big role in defining general body sizes in this class. While different builders label their instruments by different names, most are analogous to one of the descriptions below. Martin: Martin names their guitars by size 0, 00 and 000, or aught, double-aught and triple-aught. Aught-sized are in the parlor or tenor class, 00 guitars have larger bodies and 000-sized larger still. They also have the OM, or Orchestra Model, which is the same size as the 000 with a longer scale length. Taylor: Taylor labels their guitar sizes by name rather than number. In ascending order of size you’ll see Grand Concert, Grand Auditorium, Grand Symphony and Grand Orchestra. The Grand Concert size is roughly similar to Martin’s 000, where the Grand Orchestra approaches the size of a jumbo. You may have noticed some of the instruments in the videos above labeled as acoustic-electric guitars. This is simply an acoustic guitar equipped with electronics to amplify the sound. This means it has a pickup of some sort, and a preamp. The guitar can then be plugged into an amplifier, or run straight to a mixing board. Practically, most acoustic-electric guitars are within the medium-to-large body size, but there are all types out there, including classical. Many are available as a both a purely acoustic model, and as nearly the exact same model with the addition of a pickup and preamp. You don’t need an acoustic-electric guitar to play onstage. Many musicians simply mic’ their instruments the old-fashioned way, and some feel this results in a more natural sound. But the benefit of onboard electronics is that you never have to worry about accidentally bumping or moving away from the microphone, which allows more freedom and peace of mind while performing. That said, some beginners do like to start out on an acoustic-electric guitar. The upside is that they are easier to record with, and of course they are easier to amplify if you end up playing in front of others. The downside is that, to get a quality instrument, you'll end up spending a bit more. This is because part of the cost goes toward the electronics themselves. Again I'm going to recommend Yamaha here, in this case the FGX800C. This is a guitar very similar to the FG800 dreadnought I mentioned above, with the addition of onboard electronics and a single-cutaway design. If you feel you must start on on an acoustic-electric instrument, this is a good way to go. This article was intended to serve as a basic primer for further exploration. There are countless styles of acoustic guitar out there, from mini and travel sizes, to those made from alternative materials to acoustics that look and play more like electrics. Now that you know some of the definitions you can confidently wade deeper into the sea of information. I also encourage you to check out many brands and compare their styles. For the sake of simplicity I stuck to some of the bigger brand names in this article, but there are many, many outstanding guitar builders out there who put out amazing and unique instruments. Learning about guitars is a never-ending process, but it sure is a heck of a lot of fun. Good luck finding the right style of acoustic guitar for you!